Depression is a psychological condition that can be caused by many different factors and have a serious impact on everyday life. Some women find that their depression comes and goes depending on the time of the month, leading many to question whether there is a link between the menstrual cycle and depression. 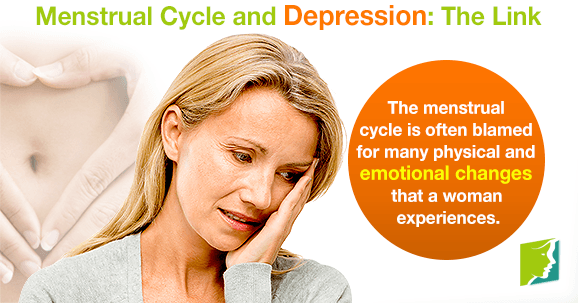 Keep reading to find out more about the menstrual cycle, depression, and the link between them. Depression means the sufferer feels a chronic sense of sadness or lethargy, and this is often triggered by no apparent cause. The individual with depression will find it hard to see the positive side of any situation, and thinking patterns can become distorted. It can often be accompanied with symptoms and behaviors that seem far out of proportion with the current state of events; for example, a person might burst into uncontrollable tears at the sight of mess, and as a result, relationships might become strained. The menstrual cycle is a series of changes a woman's body goes through on a monthly basis, culminating in the uterus shedding its lining. Each month, the ovaries release an egg, and hormonal changes prepare the body for pregnancy. If the egg is not fertilized during this time, then the uterus sheds its lining, resulting in a period. A period can last anywhere between two to seven days, and there will generally be around 20 - 30 days between each occasion. The sudden drop in hormone levels that prompt the release of blood can often result in many emotional and physical changes, including depression. Unfortunately, hormones have a huge effect on moods, so the hormonal changes a woman experiences every month are often a result of rises and dips in the levels of estrogen and progesterone in the body. Changes in levels of these hormones influence dopamine and serotonin in the brain, which are neurotransmitters directly responsible for regulating mood. As the body prepares for pregnancy, the levels of estrogen and progesterone gradually rise, and these are what cause the lining in the womb to form and thicken. Just before the lining sheds, a sudden dip in these hormones occurs, often causing changes in emotional state. Research has actually shown that low levels of estrogen can lead to episodes of depression, and this change is going to be even more marked if the dip is sudden. However, estrogen is not the only factor at play here. In order to maintain a stable emotional state, there needs to be proper estrogen and progesterone levels. There is an undeniably strong link between the menstrual cycle and depression, and these depressive episode can be very hard to control. If they are negatively impacting your life, it is worth looking into solutions. Often, implementing a few healthy lifestyle habits is the best way to avoid feeling depression as a result of the menstrual period. Read about dealing with depression during perimenopause. Are Natural Remedies Useful for Depression? Women can become depressed during postmenopause, but this should not be the norm. Click here for five steps to take to combat post menopause depression. Depression can be caused by many factors, but often a sufferer can identify habits that he or she has that worsen it.